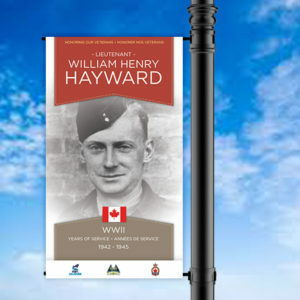 The City of Campbellton, Port of Dalhousie, and the Royal Canadian Legion branch 19 of Campbellton are coordinating an “Honour our Veterans” campaign featuring commemorative banners throughout the City and an online awareness campaign through web and social media platforms. Interested families/sponsors are asked to fill out the following form and to provide a photo of the veteran. The cost of participation is $200, and $25 from each submission will be donated back to the Royal Canadian Legion branch 19. Payment options are by cash or cheque, made payable to Maria Thompson, or by email money transfer to restigoucheveterans@gmail.com. Anticipated launch date is mid October for the installation of the banners and the social media campaign. You can download and print the form by clicking here. Forms can be submitted at Xpress printing in Campbellton. For more information or any questions, please contact Maria Thompson at 506-789-1586. Please include a high resolution 5” x 7” portrait style photo of the service person in uniform. A digital photo in .jpg , gif or similar format of 300 dpi or better. If you need scanning, please drop off your photograph at Xpress printing at 77 Water St. Campbellton. I hereby grant permission for the use of the service member's photo for the Veterans Banner Program without payment or other consideration.